One of the biggest Hollywood block-busters this summer is about the earliest days of World War II. Guest Tim Gray is an acclaimed chronicler of the Americans who defeated the Axis Powers and saved civilization. Gray is a national award-winning documentary film director, producer and writer based in Rhode Island. 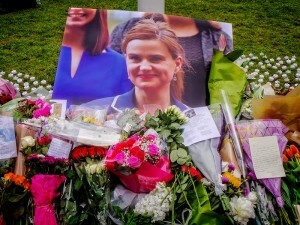 Tim has produced and directed 20 documentary films to date on the personal stories of the World War II generation. 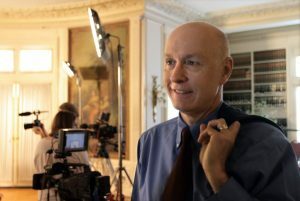 All of Grays’s films air nationally on American Public Television and also globally in such countries as China, Australia, France and England. In 2012, Gray’s World War II Foundation also dedicated the Richard D. Winters Leadership Monument in Normandy, France, a project honoring American leadership on D-Day and approved by the late Major Richard D. Winters of WWII’s Band of Brothers. To see all of Gray’s WWII documentary films, click here. 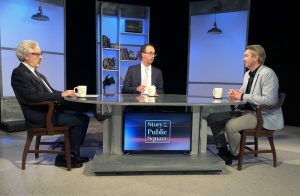 “Story in the Public Square” airs on Rhode Island PBS in Rhode Island and southern Massachusetts on Sundays at 11 a.m. and is rebroadcast Thursdays at 7:30 p.m. An audio version of the program airs Saturdays at 8:30 a.m. & 8:30 p.m. ET and Sundays at & 12:30 p.m. ET on SiriusXM’s popular P.O.T.U.S. 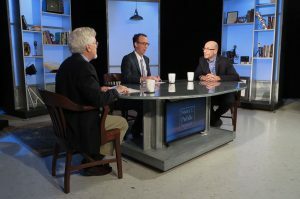 (Politics of the United States), channel 124. Story in the Public Square is a partnership between the Pell Center and The Providence Journal. The initiative aims to study, celebrate, and tell stories that matter.